While our custom deck builders build many low-maintenance decks for Omaha homeowners, we also specialize in custom cedar decks. Cedar is often preferred over other decking materials for several reasons, and cedar custom decks that are well-planned and well-crafted can out-do other types of decking in wear and beauty. At Decks, Decks and More Decks, our Omaha custom deck builders hand select every board for our decks, ensuring straight, solid and colorful boards. Cedar decks are classic and tough. Their look and style is timeless and will offer a beautiful addition to your Omaha. And when cared for well, a custom cedar deck is sturdy enough to stand the test of time and weather. Cedar decking is also a sustainable and environmentally friendly source of decking, allowing your custom deck to be built with a material you can feel good about. Give us a call at Decks, Deck and More Decks to see how our custom deck builders can add beauty and fun to your Omaha home with a custom cedar deck. This entry was posted in Custom Decks Omaha and tagged cedar deck omaha, custom deck builder omaha, custom deck omaha on June 30, 2015 by Decks, Decks and More Decks. When it comes to home maintenance and home improvement, there are often numerous choices of contractors to choose from. It’s no different with custom deck contractors, as the options for adding a deck to your Omaha home spans from DIY to handymen to deck building professionals. 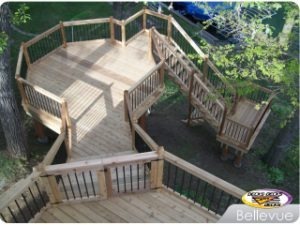 If you’re looking to select one of Omaha’s many deck contractors for a custom deck on your home, there are several things you should consider. Longevity and experience are among some of the more important things to consider. Experienced custom deck contactors will have a wide base of reviews and testimonials, knowledge of building codes and a large portfolio of custom deck work. Additionally, when adding a major improvement to your home you want to be sure you’re 100% happy before laying out a large deposit. This is why dedicated deck contractors will be willing to put the time in to review materials and layout with you. At Deck, Decks and More Decks, we provide a 3D rendering of your future deck to ensure you are happy before we begin work. 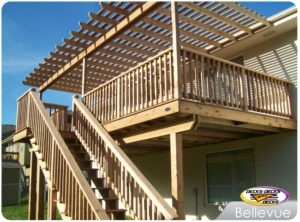 Please contact our custom deck experts to see why we are the preferred custom deck builder in Omaha. This entry was posted in Custom Decks Omaha and tagged custom deck builder omaha, custom deck omaha, deck contractor on June 22, 2015 by Decks, Decks and More Decks.